A hideous form of execution, which has not been practiced for twenty years, was revived the other day to strike terror into the hearts of the people. The murder of the Shah was followed by a succession of robberies on the road between Bushire and Isfahan, the nomad tribes going out in large parties and looting villages and caravans, and an Englishman was even stripped naked and beaten with sticks. One hundred thousand pounds was estimated as the value of property that changed hands during one week. Every day individuals came naked into Shiraz, and the roads were strewn with merchandise that the robbers found unsuitable to carry off. At this juncture H.R.H. 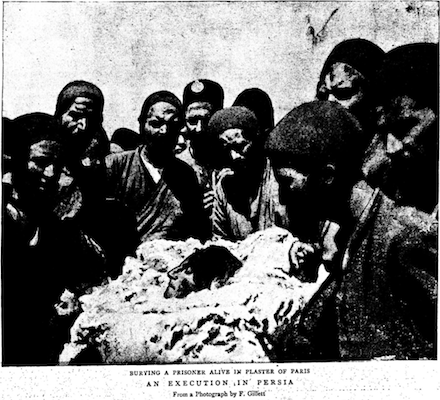 Rukn-ed-Dowleh, Governor of Shiraz, marched out of prison five men, who, common report said, had been there for the last five months, and had had nothing whatever to do with the matter, but had merely been brought from the south, because they refused to pay the excessive taxes imposed on them. These men were to be executed to frighten the people by being buried alive in plaster of Paris. This form of execution is called “Gatching,” and consists of a hollow pillar being erected over a hole about two feet deep, so that the whole forms a well into which the prisoner is put, sometimes (the most merciful method) head downwards, and at others with his head sticking out over the top; Plaster of Paris is then emptied in, and between each basketful water is poured down the well. The gatch then swells, and when it hardens it stops the circulation, causing the most excruciating agony. About nine a.m. on Sunday, May 10th, the five prisoners, chained neck to neck, were marched out of prison, and slowly escorted by a large mob, who were kept from pressing too close by soldiers with fixed bayonets and others with long sticks, they were taken to the Koran Gate, near the Bagh-i-No, on the town side of which, alongside the road, their wells had been prepared. It took one hour to reach the Bagh-i-No, but the torture of this form of execution being unknown to the prisoners, they walked along without a sign of fear. They were taken into a high-walled garden, a guard being placed at the entrance, and in a short time the first to be executed was brought out. Round his neck was a steel collar with a chain, which his guard held tightly in his hand. Someone offered him a pitcher of water, from which he eagerly drank, and then, not knowing to what awful death he was doomed, he walked calmly and without a word to his well. It took nearly half an hour to fill the well with gatch, during all which time the sticks of the soldiers were in use to keep the crowd from pressing too close and hampering the movements of those employed with the gatch. After this, the second was brought out, and as the crowd moved to the well prepared for him I took the accompanying photograph, which shows the man buried up to the chin, his face covered with powdered gatch and his eyes closed, so as not to see the crowd standing round; the gatch has not begun to set, and the man is suffering no pain. Having obtained a photograph of a form of execution which I hope has been resorted to for the last time, I hurried from the spot, and only just in time, as I afterwards heard, to escape the most heartrending scenes. When the gatch became solid and tightened on the poor prisoner, his yells were frightful to listen to, and as they were carried over the walled garden, those waiting their turn realised that the death to which they were doomed, so far from being the painless one they had hoped for, was instead of a terrible nature. As the fourth man was led from the garden he begged the executioner to take him to the Bazaar, where he would find some one to give him ten tumans (2 l.), after which he could cut his head off. The fifth man became even more frantic as the yells issued from the mouths of his companions. “Spare me! Spare me!” he cried, “and I will show you were 2,000 tumans (400 l.) lie hid,” but his offer came too late. When, three days later I passed along the road, I found capitals had been added to the pillars, covering the heads of the poor men, who had thus horribly been done to death.